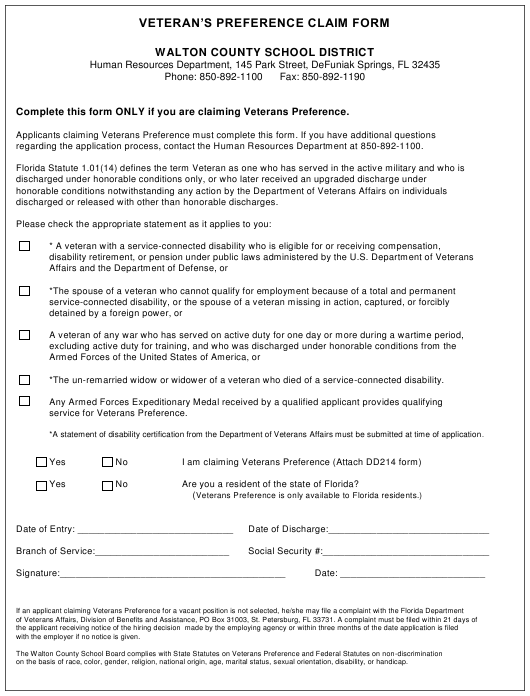 This fillable "Veteran's Preference Claim Form - Walton County School District" is a document issued by the Florida Department of Veterans Affairs specifically for Florida residents. Download the PDF by clicking the link below and complete it directly in your browser or through the Adobe Desktop application. Complete this form ONLY if you are claiming Veterans Preference. regarding the application process, contact the Human Resources Department at 850-892-1100.
discharged or released with other than honorable discharges. *The un-remarried widow or widower of a veteran who died of a service-connected disability. Are you a resident of the state of Florida? with the employer if no notice is given. on the basis of race, color, gender, religion, national origin, age, marital status, sexual orientation, disability, or handicap.